Excerpt: The words of the blessing of Enoch, wherewith he blessed the elect and righteous, who will be 2 living in the day of tribulation, when all the wicked and godless are to be removed. 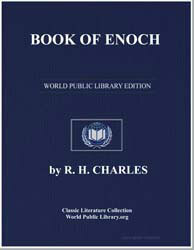 And he took up his parable and said, Enoch a righteous man, whose eyes were opened by God, saw the vision of the Holy One in the heavens, which the angels showed me, and from them I heard everything, and from them I understood as I saw, but not for this generation, but for a remote one which is 3 for to come. Concerning the elect I said, and took up my parable concerning them: The Holy Great One will come forth from His dwelling, 4 And the eternal God will tread upon the earth, (even) on Mount Sinai, [And appear from His camp] And appear in the strength of His might from the heaven of heaven.